In the actual column from today's newspaper, I preview the Emmy awards and make my usual faulty predictions on the major categories. One thing I will say, for "Mad Men" fans: AMC has chosen to air an original episode Sunday night, and it will be on in the same hour where the show is likely going to win for best drama (and when Jon Hamm and Elisabeth Moss could theoretically win acting awards), and if you have to choose between the live awards show or the filmed "Mad Men" episode, go with "Mad Men." It's the best episode of the season by a long, long measure, and one of the best episodes of the series to date. Not that I'm into hype or anything. Since I've seen it in advance, and since I have to cover the Emmys for the paper (theoretically, my column will go up on the NJ.com blog within a half hour of the show ending), I'll be watching NPH and the Emmys. The rest of you, though, just stick with Sterling Cooper. Can't argue with your predictions, but would love to know what your wishlist of winners would be if you were the entire emmy voting jury. Who do you WANT to win? Also, think Lost and Flight of the Conchords have any kind of a shot at winning the writing categories (where respectively Mad Men and 30 Rock completely dominated those categories)? It seems almost cruel to have them in the noms in the first place. And, thanks for the MM reminder. Duly noted. No thoughts on the writing awards, Alan? As for writing, Mad Men and 30 Rock are gonna win, obviously. I can't parse which episode the voters will prefer, but my own choices would be "Apollo, Apollo" for 30 Rock, and "Six Month Leave" for Mad Men. And Alan, don't forget, in the midst of the Emmy's, not only is there Mad Men to worry about but the season premier of Curb, AND the Giants are playing the Cowboys....will have to watch that live, record curb and MM, and skip the Emmy's altogether. Alan, just curious if you meant (as I assume) that the upcoming episode of mad men is the best thus far this season or of the entire 3rd season? You watch episodes in advance, so I was really struck by your comment. I thought "the fog" was brilliant, so I'm beyond excited now for this Sunday! Best of the season so far. I haven't seen past this episode. At this point, I'm generally only getting episodes a few days before they air. I'd love, love, love if NPH won for supporting actor, but does him being the host make any difference for his chances? I want Hamm to win SO MUCH. BUUUUUTTT, god, Cranston is doing somehting on a whle other level. I would not be shocked at all to see him repeat. I LOVE LOVe LOVE and worship MAD MEN and think Hamm is one of the best actors around and this is the role he was born to play but the second season of BREAKING BAD was just amazing. That one scene with the camera on Walter's face as he lets her die was one of the greatest moments of anything I have seen. Man, these are two amazing actors doing the best work out there. I'm totally DVRing the awards so I can just FF through the crap to get to the noms I care about and to see all of NPH's bits. and will be watching MM live, of course. I just KNOW he's going to be as good as COB was. Don't know if it will help NPH, but it didn't help Eddie Murphy. In 1983, he hosted the Emmys and was nominated in the comedy supporting actor category for SNL. However, Christopher Lloyd won for "Taxi." I remember it because Lloyd wasn't at the ceremony. They had live shots of the present nominees (and a picture of Lloyd) as the winner was named. Because Lloyd wasn't there, the camera stayed with Murphy as he gave a long, exaggerated look of shock after his loss. With Bryan Cranston and Jon Hamm duking it out for however many seasons their (both entirely excellent) shows run, it appears that AMC has the Best Actor award sewn up for the forseeable future. I'm glad I don't have to choose between them, since both of them gave Master Acting Classes in the second seasons of their shows. I watched the Emmys after the Sopranos final season, where they honored the entire cast. I will never watch the show again until the Wire is recognized. Mad Men should win this year and every other year, unless a show about whites in the 1950s or 40s comes out. it appears that AMC has the Best Actor award sewn up for the forseeable future. Barring something just unbelievable from those two during the next eligibility period, Hugh Laurie's probably going to win the award a year from now. The House season premiere is as ideal a piece of Emmy-bait (both in what it's doing and how well it's doing it) as I've seen in a long time. True, but we all know the Emmys are notorious for giving the same person the award year after year. I remember John Larroquette won the supporting actor Emmy for about 83 years in a row before he withdrew his name from contention. I bet the Emmy people would still be giving Larroquette the award every year if they could, even though Night Court ended in 1992. Sally Field is terrible, and she's in a terrible show, and yet she's nominated for an Emmy. I realize that's nothing unusual, but it's the kind of the that ensures I'll be watching Mad Men and not the awards broadcast. I agree with pretty much all of your predictions. If Cranston took it again, I would be just as pleased. Hamm and Cranston (like Kirchhoff stated) are doing absolutely beautiful work on their respective shows. I hope Laurie does win one in the future because he is deserving (last season was just uneven and slightly unsatisfying until the final episodes). I know Byrne works equally as hard at his craft while doing In Treatment. I like all of them. I think Aaron Paul is most deserving of the award for supporting. 30 Rock-I get it, it's clever, well-written but it was very uneven last year. I can't form an honest opinion because I do not watch it on a regular basis. Mary-Louise Parker-love her work on Weeds but the past 2 seasons have not been worthy of a nomination. She should have gotten one for Weeds in their 1st or 2nd season and won one, imho. I like Fey, she's got the world in her hands right now. Though Collette walking away with the award would please infinitely me. Glenn Close or Elisabeth Moss-would be pleased with either. I like all of the other actresses in that category but Close and Moss are the stand-outs to me. I don't know what I'll be dvr'ing and watching in real time yet. Emmys and Gold Gloves are the two awards where no one's a one-time winner. Tell that to Michael Chiklis. After he won, it was like the Emmys wanted to pretend that never happened. Why did Emmy keep the "Reality Host" category but dump the enjoyably awkward Talk Show Host/Variety Performer category? Were they afraid they couldn't top Colbert vs. Manilow or something? Removing a category where Stephen Colbert could win or else lose and still make something entertaining out of it is a tragedy. Although some reality hosts have a little personality, very few do much more than repeat the rules of the game over and over again. I will tape Mad Men and watch it immediately after the Emmys. I need to lend NPH my support, regardless of who wins the awards. I am hoping for a closing improv song too. i'm only 4 episodes into the first season of mad men. i should not have read your emmy predictions column. I really hope that the next episode of mad men is as amazing as you said. So far, the only episodes I've really liked are Old Kentucky Party(?) and last week, which was only interesting due to Pete and Peggy. As for the Emmys, Steve Carell deserves some love. Alec Baldwin is good, but his shtick is getting old. The character Michael Scott was amazing last year; we finally saw the idiot-savant of Michael during the buyout. Broke was the best episode of the year. And finally, AARON PAUL FTW. And where's Bob Odenkirk's guest actor award? I'd love to see Michael Emerson win, but I can live with some of the other choices as long as its not Shatner...though it probably will be. Big Mad Men fan, but really hope Breaking Bad takes top drama, easily the best thing I've seen this year (would personally put Lost 2nd, MM 3rd). And as much as I love Jon Hamm, Cranston somehow managed to be even better in Season 2 than 1; I think I may have been watching the greatest tv lead acting performance that I've ever seen. And agree on Aaron Paul for supporting, he was the main thing I didn't like about the show early in S1, but really has become phenomenal. Have no problem w/ 30 Rock winning again, b/c it still made me laugh harder than the Office, even in subpar episodes, although Office had the stronger season as a whole. Won't be watching, and don't particularly care who wins, but glad Piven was not nominated, just hope Kevin Dillon (formerly my favorite part of that show, now just an irritant) doesn't take it, rooting for the previously snubbed Morgan. I stopped watching HOUSE after they broke up his first team. the show has been on too long and is just so uneven. Love Laurie but that show has been played out. Oh yeah, don't hold your breath on THE WIRE. Emmy's biggest shame. I'm definitely pulling for Aaron Paul to win Best Supporting Actor - I did a little fist pump when I heard about his nomination. That said, I'd be ok if anyone other than William Shatner won the award. Personally, it would be pretty cool if Christian Clemenson won the award. I'm all for Abel Koontz to finally get some love. Thank god the Patriots and Jet play in the afternoon. Like virtually every live event other than the Oscars, the Emmys are shown with a three-hour delay on the West Coast. On the other hand, the cable networks don't have separate East and West Coast feeds, so we see all of those shows three hours "earlier," given the time difference. The upshot is that we can watch "Mad Men" and then the Emmys. Or not bother watching the Emmys, since we've usually heard who one by the time they get around to broadcasting them here. ... who won, that is. Did the Academy revoke his award? Surely once an Oscar winner, always an Oscar winner? Alan, to be fair, as great as MC was in the whole run of THE SHIELD, that first season of his was the best as far as his performance over the whole series goes. At least he won it for his strongest work. I don't know. Chiklis was fantastic in the finale too. I can somewhat understand the omission of him in perhaps the toughest category this year, but at the same time, it's the last year for The Shield, and that episode alone should have gotten Chiklis that nomination. 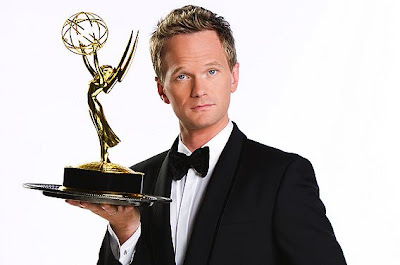 But definitely looking forward to NPH's take on the Emmys even though I'll have to watch it after Mad Men. Don't foget, if your time zone permits, there's an immediate repeat of the Mad Men episode. I'm on the East Coast and plan watching Emmys in full or if show runs long until 11:02, when the 2nd run of tonight's MM begins. I'm fortunate in being able to sleep in tomorrow, so the later broadcast is no prob. "Comedy actress: Probably Collette for the sake of someone new, but Fey would be absolutely deserving if she won again"
I continue to be baffled by why so many critics consider Tina Fey to be a good actress. Frankly, I don't really see much difference between her performance and that of Jerry Seinfeld's, and he routinely got excoriated for his acting ability. I bet that the Office would suffer greatly, but that 30 Rock would be almost as funny.